In what follows, I argue that misogyny in the Muslim community is a form of Islamophobia. To support this claim, I first define the terms misogyny, Islamophobia, and Islam to demonstrate how the three terms are linked. I then provide a brief statement of Islamophobia in the West to emphasize the disclaimer that this argument does not suggest that Islamophobia will perish once misogyny in the Muslim community perishes; in other words, Islamophobia is more profound has a grander history than the misogynist interpretations and practices of Islam that often incite it–or, in other words, Muslims’ role in it. The discourse surrounding Islamophobia, including effective responses to countering it, consistently fails to address one major issue that contributes significantly to the perpetration of Islamophobia: that of misogyny. 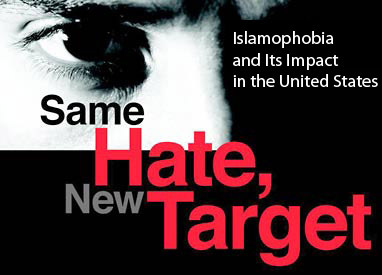 According to its most basic definition, “Islamophobia” is the irrational fear and hatred of Muslims and/or Islam. I employ this definition to argue that Islamophobia is not propagated by non-Muslims alone but also by Muslims who uphold and promote misogynist interpretations and/or practice of Islam, maintaining that Muslim women should face dislike and discrimination compared to Muslim men in the practice of Islam. – Islam: a religion that requires submission to the will of God – a will that includes and demands communal good, which, I’m going to argue, includes social justice, which in turn is incomplete without gender justice. – misogyny: an ideology that allows and facilitates the marginalization of women through abuse, mockery, neglect, and other acts that harm women physically, emotionally, psychologically, and otherwise. This includes, importantly, the marginalization and mockery of feminist Muslim women, Muslim female leaders and scholars, and more broadly Muslim women’s practice of Islam according to their understanding of it. – Islamophobia: the irrational, unfounded fear of Islam (as defined above); and this fear/hatred may be perpetrated by anyone whether Muslim or not. Note that these definitions are not necessarily outlandish or unfounded; most Muslims would agree with them—after all, we all agree that Islam is submission to the will of God (and I simply add that that will includes social/gender justice, which, frankly, who could deny that, right? ); misogyny is an attitude that harms and subjugates women; Islamophobia is the fear and hatred of Muslims or Islam. An immediate question that may come to the audience’s mind is whether a Muslim can indeed be an Islamophobe. Actually, yes. In fact, I believe that our reluctance or discomfort in seeing misogyny as Islamophobia speaks to our refusal to see women (Muslim women) as full humans. That is to say, somehow our misogyny is not Islamophobia because it’s not as though (some) Muslim men hate “Muslims”; they merely hate Muslim women. Yet, everyone agrees that Islamophobia is by definition the hatred and fear of “Muslims” – but it’s interesting that “Muslims” here doesn’t really seem to include Muslim women. The definitions I’m offering require that the hatred of Muslim women be declared Islamophobia – fear of Muslims in a way that includes women, too. In other words, by recognizing misogyny as Islamophobia, by recognizing that hatred of the Muslim woman by Muslim men as an Islamophobic act, we are essentially acknowledging that Islam is not just a man’s religion, and “Muslim” doesn’t mean men alone; Islam is also a woman’s religion, and “Muslim” includes women, too. This point is especially important when we also condemn the misogyny of correcting Muslim women’s practice of Islam: Muslim women’s practice of Islam as they themselves understand it or according to their own experiences is often mocked and relegated to a lesser form of Islam than that of a mainstream variant, which unfortunately happens to be deeply patriarchal. This is especially the case with feminists Muslims’ interpretation of Islam where the more traditionalist Muslims’, primarily men and male leaders, dismiss the perspectives, experiences, and knowledge of Muslim women leaders. I maintain that this is Islamophobia particularly because of the traditionalist Muslim’s fear and hatred of a more gender egalitarian Islam that embraces feminism as a reality. Importantly, Islamophobia evokes misogyny within Muslim communities to claim that Islam is inherently, theoretically, and practically a misogynistic religion. Often, this claim is inspired by misogynist values espoused by some Muslims, especially some Muslim men. This way, both Islamophobes and Muslim misogynists share a similarity: They believe that Islam inherently views women as inferior to men. What is interesting, however, is that most of us would condemn the remarks of popular Islamophobes like Bill Maher and Ayaan Hirsi Ali as Islamophobic when they declare Islam a religion of violence against women. Yet, when a Muslim misogynist practices the kind of Islam that Maher and Hirsi Ali claim is the Islam of the Qur’an and the Sunnah and strongly believes that this is actually the Islam revealed by God, we are rather reluctant to categorize them as Islamophobes. I question this move and instead propose that misogynist Muslims be condemned for their misogyny, especially if we argue that Islam itself has no place for misogyny. The rejection of “Western” values, even at the expense of promoting misogyny, is one of the problems in Muslim societies that Islamophobia responds to. These “western values” commonly include interpretations of Islam that promote gender equality, a claim that some Muslims insist is a western enterprise with no roots in Islam. Yet, these same Muslims, in contemporary times, may be hesitant to openly claim that women are inherently inferior to men and thus deserving of subjugation by men. From an activist standpoint, we should ask ourselves how to deal with the misogyny in our community, and how to counter Islamophobia effectively when Islamophobes use the beliefs and practices of the misogynists in our community to further their fear and hatred of Muslims and Islam. In other words, Muslim men (#notallMuslimmen, anyone?) need to take responsibility for their role in inducing Islamophobia and understand that not only is Islamophobia partially a product of their practice of Islam but they themselves are displaying Islamophobia when they promote and practice a less gender egalitarian Islam than what they would probably attempt to be striving towards. However, to reiterate, we need to emphasize this while, first, recognizing that Muslim men, too, and not just women, have been victims of Islamophobia and that this discussion is not an attempt at demonizing Muslim men; and second, acknowledging the deeper roots of Islamophobia and not reducing Islamophobia to our misogyny alone. P.S. For a follow-up on this argument, which was presented at the 6th Annual Islamophobia conference at UC Berkeley this year, please see the blog post The Ideal Victim and the Ideal Perpetrator of Islamophobia with some thoughts on the conference (spoiler: it was fabulous!). This entry was posted in Death to patriarchy and tagged Islamophobia. Bookmark the permalink. 10 Responses to Misogyny in the Muslim Community is a Form of Islamophobia. The reading is interesting. But to me these issues are more cultural than it has anything with Islam. However, the fact is that most of the Mullahs have made these cultures part of Islam to appease some influential and now the culture has become Islam. So now is the time to call a spade a spade. Where ever and who ever practices misogyny are to be condemned, not only condemned but to be corrected too. Truth, SN! Muslim women cannot win this environment. Our leaders claim we have all these rights within Islam and so we don’t need feminism (!! This is some ugly piece of BS!! ), but when we say, yes, yes, okay, but where ARE those rights in practice?! They tell us to keep quiet because no need to air our dirty laundry. We lose both ways – we never end up reclaiming our rights back, and the Islamophobes never end up stopping just because we aren’t openly demanding our rights.